Hey, let’s sit in a big metal box and hurl it down the road at 70-plus miles per hour, with other metal boxes coming at us just as fast. It didn’t start out that way. 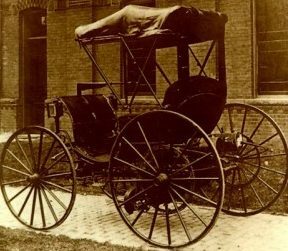 When cars were invented in the late 1800s, they were little more than buggies without the horse. The first models traveled at 10 to 12 mph. The Model T’s top speed was about 40 mph. But the low cost of the mass-produced automobile, the freedom it afforded us and the siren call of modern advertising has kept U.S. consumers addicted to an unsafe, wasteful and anti-social form of transportation. Auto makers, with encouragement from government, have made cars safer with seatbelts, anti-lock braking, airbags and most recently a myriad of electronic driver-assisted technologies. But the U.S. National Highway Traffic Safety Administration still conducts crash tests at speeds of only 35 mph, which is the speed (if you’re lucky) of city traffic. For travel on highways, cars remain death traps. Just watch this video of a high-speed head-on collision. Cars waste money, energy and other resources. Paying for the car itself is just the tip of the financial iceberg. There are taxes, insurance, maintenance and repair. Our cars require their own room in the house, something called a garage. Which, by the way, also enables our addiction to junk by giving us more room to store stuff. Gas is cheap today, which encourages more driving, which means more pollution and more deaths. According to the NHTSA, the number of fatalities on the highways were up 7.7 percent in 2015. More driving (and drivers) means more traffic and clogged roads. Our highway infrastructure is already in bad shape. Do we really want to spend precious resources to build more roads? In crowded metropolitan areas, there’s no space for them anyway. One hopeful sign: many of the younger generation aren’t buying cars. Partly because they don’t have much money, partly because it’s easier and cheaper to use a car-sharing service and partly because they are smart enough to recognize how many resources cars waste. Drivers have become downright mean. Traffic congestion is pushing our tolerance to the breaking point. Because we feel protected by our steel cages, we are overly aggressive and make stupid moves – things most of us would not typically do face to face. But isolated in cars we are inclined to think only about ourselves. Traveling with our fellows encourages tolerance and civility. We realize that we are one among many. Well designed mass transit moves people efficiently. It can also give us unexpected and interesting experiences, like art and music in the station or running into a friend or acquaintance on the train. Modern technology should focus on new transportation possibilities. Instead, our top tech companies stick with the flawed concept of a car on a road. They are racing to make the car autonomous, but it will still be a car, will still require a road and will likely still only have one occupant. So far, there is no evidence that it will be any safer. In fact, our reliance on such technology might make us less safe, as a recent Tesla crash demonstrates. The 20th century was the century of the automobile. It didn’t invent a faster horse; it replaced it with something entirely new. Let’s step out from behind the wheel and see where that leads.